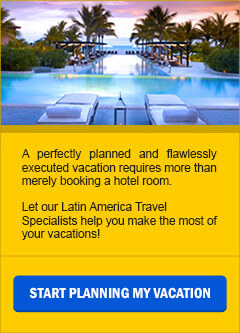 A seven-day, one-of-a-kind Travel Experience of Ecuador’s Andean World, from colonial and modern Quito, to the fertile valleys of Otavalo dotted with beautiful Haciendas and the spectacular beauty of the Mashpi Cloud Forest Reserve, home to the Mashpi Lodge, a member of the National Geographic Unique Lodges of the World. This is a journey along the history, the spirituality, the flavors, the customs, traditions, and legends of the Ecuadorian Andean Region. During this 5-day Amazon Cruise on board the Manatee Amazon Explorer, you will enjoy a cruise of the Napo River on board the first class Manatee River Boat. La Pinta Galapagos Deluxe Cruise West Islands on board the Luxury Motor Yacht La Pinta takes you on a 6-night cruise to discover North Seymour Island, Punta Vicente Roca, Urbina Bay, and Tagus Cove in Isabela Island, Punta Espinosa in Fernandina Island, Rabida Island, Post Office, Punta Cormorant and Champion Islet in Floreana Island, Charles Darwin Research Station, and Cerro Dragon on Santa Cruz Island. La Pinta Galapagos Deluxe Cruise North Islands on board the Luxury Motor Yacht La Pinta takes you to El Chato Tortoise Reserve, Bahia Ballena, Chinese Hat Islet, Santa Cruz Island, and the Bartolome Island, Sullivan Bay in Santiago Island and Darwin Bay and Prince Phillip Steps in Genovesa Island. La Pinta Galapagos Deluxe Cruise East Islands on board the Luxury Motor Yacht La Pinta takes you on a 4-night cruise to discover the wonder of South Plaza Island, Cerro Colorado Tortoise Centre, Punta Pitt and Cerro Brujo in San Cristobal, Punta Suarez and Gardner Bay in Espanola and the Charles Darwin Research Station in Santa Cruz Island. This 5-day Isabela II Galapagos Deluxe Cruise South Islands vacation package on board the deluxe M/Y Isabela II takes you to Santa Cruz Island, Floreana Island, Espanola Island, and San Cristobal Island. This 7-day Isabela II Galapagos Deluxe Cruise North Islands vacation program on board the deluxe M/Y Isabela II takes you to San Cristobal Island, Prince Phillip Steps and Darwin Bay in Genovesa Island, Buccaneer Cove and Puerto Egas in Santiago Island, Punta Espinoza in Fernandina Island, Tagus Cove, Urbina Bay, and Punta Vicente Roca in Isabela Island, Red Beach in Rabida Island, and Dragon Hill in Santa Cruz Island. This 5-day Isabela II Galapagos Deluxe Cruise Central Islands vacation package on board the deluxe M/Y Isabela II take you to Santa Cruz Island, Santa Fe Island, South Plaza Island, North Seymour Island, Bartolome Island, and Santiago Island. This 8-day Grace Galapagos Deluxe Cruise vacation package follows the footsteps of Darwin to Daphne Major Islet, Santa Cruz Island, Santa Fe Island, South Plaza Island, Tower Island, Fernandina Island, Urbina Bay and Tagus Cove in Isabela Island, Santiago Island & San Cristobal Island, with many opportunities for nature walks and hikes, snorkeling, and panga rides. This 8-day Evolution Galapagos Deluxe Cruise vacation package traces the footsteps back in time on the route from San Cristobal Island to Floreana, exploring the wonders of the islands South Plaza, Santa Cruz, Daphne, Santiago, Genovesa, North Seymour, and Santa Fe with many opportunities for nature walks and hikes, snorkeling, kayaking, and panga rides.